Our Solar Advisors are the first set of eyes on your roofline. They'll check out your home and make sure you're set up with a Solar Home Advisor to get you on the path to solar! They make our process smooth and easy for anyone to go solar. 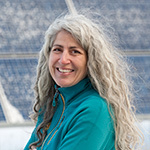 Nicole has lived in Vermont for almost 40 years with a few adventures that led her around the world by way of Boston and D.C. With a Masters in Education, Nicole has worked in both international and domestic areas of leadership and management development, including a six-month position implementing greening initiatives for the U.S. Embassy Kathmandu, Nepal. These experiences, combined with exposure to the daily challenges of living in developing countries, made Nicole realize, she had the ability to really make the world a better place by making sure she first was living responsibly, putting the environment first. Nicole is thrilled that her personal values are supported at SunCommon where she contributes to bringing clean energy to homes throughout Vermont at an affordable cost. Nicole loves to be outside as much as possible with her daughter and her partner Pete: gardening, hiking, backcountry skiing, biking, motorcycling; and when the weather isn’t cooperating, they are inside reading, writing, cooking, and listening to music.